I had a round birthday on Saturday, October 29th. You know, one of those ending with a zero. It has turned out pretty well, and I'm ready for my new decade. I'll sum up my birthday with three words: Cookies, Cake, and Love. I'm still trying to be good about not buying more yarn until I knit up more of my stash. Combine this goal with my ongoing efforts to get in better shape, and I hope to soon be ordering a new exercise set to add to my workout regimen. My ALF has also progressed nicely, as I have a mere 18 rows left to knit. There are, however, 437 sts in each row now, and six rows from now the shawl will have reached its full 443 stitch width. I finished knitting a Kiri in worsted weight yarn for a Christmas gift. Yes, I have completed a Christmas gift before Halloween! We'll just see how well I do with the rest. I knitted Kiri on US 10.5's, worked seven repeats of the lace pattern, and did a garter-stitch border rather than the lace one. I really like it, and would use it myself if it weren't going to be a gift. This is the second Kiri I've knit this year, and the first one was also gifted. It is such a lovely shawl, and I just may have to knit it again someday. Oh, so beautiful. Lacy, elegant, shimmery, lovely, gorgeous...ahhh...me wants it. The pattern is free and looks simple to knit. I just need the yarn. Ah, but what color? Hmmm...I can envision it in many lovely shades. I guess I'd definitely need to wear a slip with that skirt, eh? I even like to gaze at the skirt being blocked. Wow! 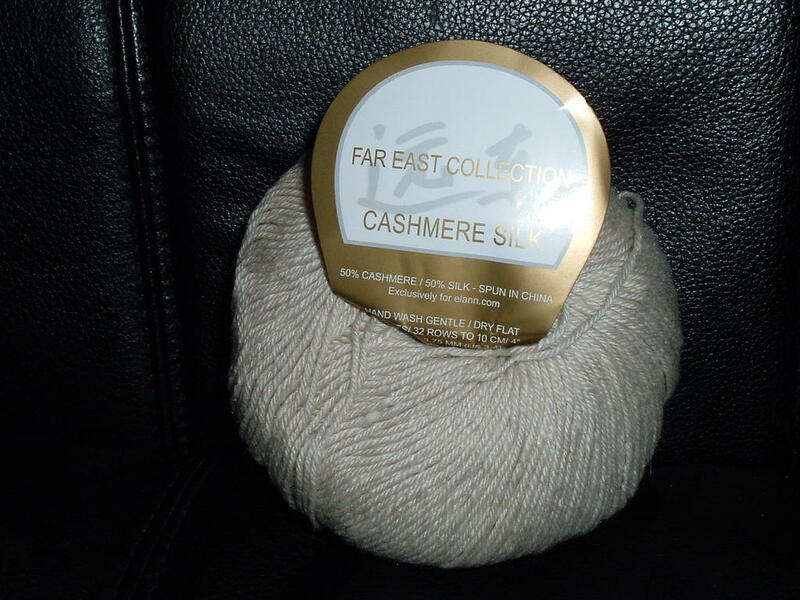 I got this lovely Cashmere and Silk Yarn from my Secret Pal this week. Thank you so much! I have been fantasizing about what this will become. It is so soft and lovely! It was such a treat to find the package in the mailbox. This really has been a bright spot in my week. Secret Pal is such a nifty idea! I'm gathering things to put together a second package for my Secret Pal. The shawl is coming along well, and I like the pattern more and more as I knit it. I also began a pair of socks for my husband in Opal Rodeo 1158. I'm working them both on one long circular needle from the toe to the top. So far, they just cover his toes. I will be knitting some more baby booties again because I got the invite for "Pedro's" baby shower for the 22nd of this month. I've been back on Knitpicks and think that I would really like the Sweet Mary Jane Cardigan. I think it's a really cute pattern. I've always wanted to knit a lacy cardigan. This is also a pattern whose sales support breast cancer research. Breast cancer runs through my family pretty strongly. I have an aunt battling it right now. I feel like I want to knit this cardigan and maybe even in Alpaca Cloud Peppermint. I'm mentally getting ready to dive in for some Christmas knitting. I'm beginning to form a plan. Oh dear, all this thinking cannot be good.